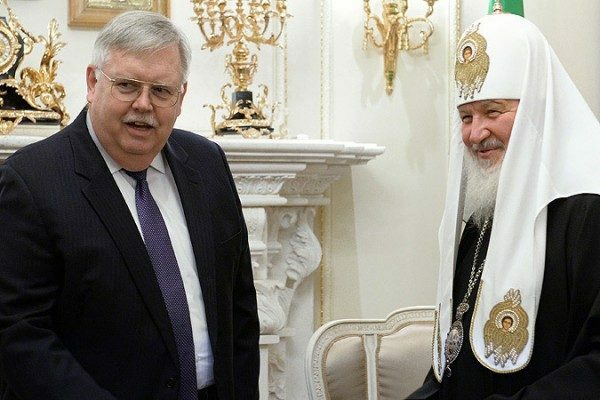 On August 29, 2016, His Holiness Patriarch Kirill of Moscow and All Russia met with the Ambassador Extraordinary and Plenipotentiary of the USA in Russia, Mr. John F. Tefft, at the Patriarchal residence in the St. Daniel Monastery. They were joined in their talk by Mr. Anthony Godfrey, minister-counselor for political affairs, and Mr. David Horn, second secretary of the US Embassy. The Moscow Patriarchate’s department for external church relations was represented by Archimandrite Philaret (Bulekov), a DECR vice-chairman, and Archpriest Sergiy Zvonarev, DECR secretary for the far-abroad. Mr. Tefft thanked His Holiness Kirill for the opportunity to meet. He also informed the Patriarch about his trip of Arkhangelsk, where the celebrations to mark the 75th anniversary of the lend-lease program are to take place. ‘I have long wanted to realize my dream to come to the Solovki Islands. We will see there one of the most famous monasteries and familiarize ourselves with one of the most interesting historic places in Russia’, Mr. Tefft said. Addressing the head of the US diplomatic mission in the Russian Federation, the Primate of the Russian Orthodox Church noted that under the Soviet power, the Russian North, Eastern Siberia and the Far East saw the most terrible destruction of church life. ‘Before the 1917 Revolution, there were 200 churches in Yakutia. Then everything was destroyed’, the Patriarch stated, ‘When I, as a young man, came to Yakutsk in 1971, I saw a small wooden house in which there was no floor, for it went into the ground. There was a terrible wet and an awful smell. There were 5 or 6 old women praying there and a disabled priest. There was a church only in Irkutsk and Khabarovsk for the whole Far East and Eastern Siberia’. As for the Solovki monastery, His Holiness said it is a monument not only to the spiritual life of our people, but also to people’s recent suffering, for in the Soviet time, there was a terrible GILAG camp in Solovki. ‘My grandfather did time in it. He was to die but the Lord saved him and he survived by a miracle’, he said. Then they discussed topics of mutual interest, including the process of peace settlement in Syria. In conclusion of the talk, His Holiness Kirill presented the guests with tokens of the meeting.